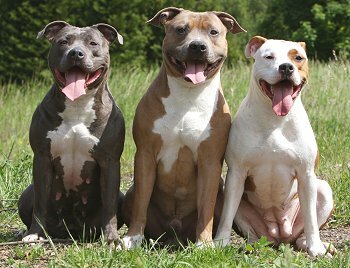 Now known as the American Pit Bull Terrier, this dog breed has been recognized and registered by the United Kennel Club since 1898. Color: All colors, patterns, and combinations permitted. Any eye color except blue. Grooming: Brush, trim nails, and clean teeth weekly. Weight: Males, 35 to 60 pounds; Females, 30 to 50 pounds. Nicknamed the Yankee Terrier, Pit Bull Terrier, Half and Half, and American Bull Terrier, this breed has long been admired for its tenacity, courage, agility and spirit. A loyal, strong and energetic companion, today’s American Pit Bull Terrier continues to provide good company to his owner, and also excels in everything from bomb detection, herding, therapy, search and rescue, to obedience. While Pit Bulls can make excellent pets, they are not for the first time owner. They might not go looking for trouble, but they won’t back down from it either. While the American Pit Bull Terrier is friendly with children, supervision is in order because of his power and strength. It is essential to socialize this breed with humans and other animals early on. Early training and socialization result in a calm and loving dog. This athletic breed requires a good amount of space and exercise. A fenced yard will help provide an area to burn off energy. Pit Bull’s often excel when they have a job to do. Owners of the Anmerican Pit Bull can pick just about any sport (weight pulling, flyball, rally), and their dog may fill the house with award ribbons. Wary and at times unfriendly with new dogs, an APBT (typical of the Terrier breeds) is not the dog for a family that loves new animals coming in and over to play. Potential owners need to know that breed specific legislation (and home owner’s insurance policies) may target their breed. APBT owners take on an important responsibility to dispel bad press.